Joel on Software: the book! the interview! the dessert topping! Stew song on Everwood tonight! GODvsBUSH Originally uploaded by artlung. 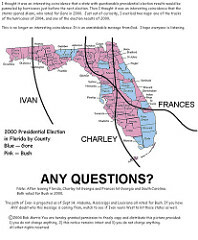 Silly projection of the recent hurricanes (Ivan, Charley, Frances) onto a map of which counties voted for Bush or Gore. A fun forward from my friend Erin.